Yamanaka Castle (山中城) is the ruins of mountain castle built in 1560 by Hojo clan. This castle was located on the other side of Mt. Hakone from Odawara castle, and very important castle to protect that castle. Yamanaka Castle remains the almost complete structures of middle age mountain castle. There is a parking and restroom. Parking will close at evening. Yamanaka Castle was built for the protection of Odawara Castle. It is located on the Tokaido Line. This castle was defeated by Hideyoshi during the battle of Odawara in 1590. This castle has the almost the complete structures of the middle age mountain castle. There is no stone wall used in this castle, but uses lots of dirt hills, and dry moats. Unlike other mountain castles, this castle was not placed on the top of the mountain, but slope of the mountain. This is because this castle was not only for the protection, but also designed as the gate of Sagami area. Honmaru and Ninomaru (2nd Bailey) were divided by a dry moat and connected by dirt bridge. Ninomaru was built by flattening the mountain top. Still for the purpose of the defense, the area was still form a slope. Tenshukaku (Main Keep) was built on the top of the mountain (586m from the sea level). ... one of the biggest bailey with excellent view of the area. This bailey has 3 small C shape baileys around it. All the moat was also the water way and designed to flow water to a water storage. 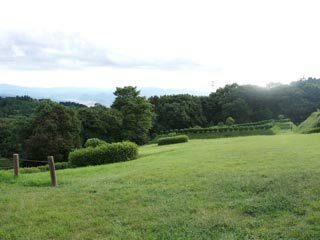 ... was built suddenly for preparing the battle of Odawara against Hideyoshi. The structures of the bailey are well preserved and you can see the combination of dry moat and dirt hills of Hojo style Castle.